Operation this morning of the first train over the Broadway-Fifty-ninth Street extension of the Brooklyn Rapid Transit subway system to its new eastern terminus at the Queensboro Plaza adds the third transit line connecting Manhattan with the Bridge Plaza, Long Island City. 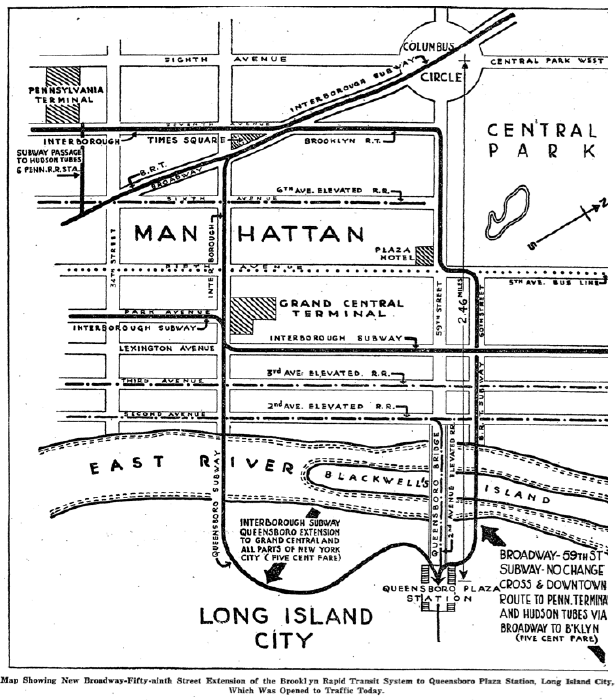 It affords a direct route without transfer crosstown and downtown from Queensboro through Broadway, Manhattan, to Brooklyn. This new acquisition supplements the existing Interborough subway (Queensboro extension) and the Second Avenue elevated line, all three of which now meet in the large transfer station at the eastern end of the Queensboro (Fifty-ninth Street) Bridge. The great midtown district of Manhattan between Thirty-fourth Street and Seventy-second Street lies directly opposite Long Island City, and the new transit line now permits of greater dispatch in travel between these two important sections of the city, the Queensboro Plaza being separated by only a fifteen-minute run from Grand Central and Times Square; a ten-minute run from Fifty-ninth Street and Fifth Avenue and a seventeen-minute run from the Pennsylvania Terminal. This proximity of the Bridge Plaza district of Long Island City permits of relief of Manhattan's congestion at the belt of the island, which has recently been developing commercially to unprecedented proportions, by the transformation of hotels like the Knickerbocker and Manhattan for utilization as office buildings, by the Park-Madison co-operative office structure now being erected, by the Liggett-Winchester-Ley building in course of construction by the Fred T. Ley Company, Inc., at Madison Avenue and Forty-second Street, the Heckscher building at Fifty-seventh Street and Fifth Avenue and the buildings of the Kelly-Springfield and Fisk Tire Companies, also in the Fifty-seventh Street district. Recognition of this proximity to the business centre of Manhattan and the ease and dispatch in travel to and fro has influenced big interests in New York City and elsewhere to make large permanent investments on the Queensboro Plaza. These include the Garford Motor Truck Company, Inc., which has plans drawn for the erection of a twelve-story building occupying a block front and will be another of the prominent automobile concerns to establish its executive and sales forces in Long Island City, the White Automobile Company having already established both its domestic and export offices in this vicinity. The Standard Steel Car Company Is erecting a five-story building, and on the adjoining block, 200 by 400, the Hellman Motor Corporation is now driving plies for the erection of a complete service station for the 100,000 Ford owners in New York City. Across the Plaza from these concerns, the Cadillac Oil Company has purchased ground and has plans for the erection of a building. The Brewster Automobile Company has been established for many years on a block front facing the Bridge Plaza. The Plaza district is the financial center of Long Island City, where are established the Title Guarantee and Trust Company, now building its new home; the Long Island City Savings Bank, which has just completed a pretentious structure; the American Trust Company, the Corn Exchange Bank, the First Mortgage Guarantee Company, the Bank of the Manhattan Company, the Irving National Bank, and the substantial structure of the New York and Queens Electric Light and Power Company, which occupies a solid block front facing the Plaza, and although five stories now, has foundations for twelve. It is believed that the character of such permanent establishments will influence other high-grade concerns to centre their offices and showrooms on the Queensboro Plaza, where they can have more prominent location, with better transit facilities and closer contact with the heart of New York, than they could secure in Manhattan at a cost three or four times greater. Far-sighted concerns are already doing this, recognizing that, in addition to savings effected, there will also come an increased efficiency by combining their executive offices with their display and distribution warerooms instead of operating them as they have been hitherto forced to do, in scattered groups because of high rents in Manhattan. The Queensboro Plaza, according to figures of Dr. Harriss of the Police Traffic Department, is the eighth busiest traffic centre in New York or London; 18,000 vehicles passed this point daily in October, 1910. This figure during the heavy Summer travel is estimated at nearly 40,000 vehicles daily. The plaza has been likened to the broad neck of an hour glass through which the bulging commercial traffic of midtown Manhattan travels to and fro to feed the large industrial and commercial interests established in Long Island City and the outlying parts of Queens. That the neck of the hour glass in broad enough to accommodate such enormous traffic is shown by the fact that the Queensboro Plaza is 250 feet in width, thus permitting the erection of high buildings, whereas the width of sixty feet on the ordinary business thoroughfares makes it practically impossible to build more than eight stories in height without setbacks, which so reduce floor area that only in exceptional places would it pay to erect them higher. The growing importance of the Queensboro Plaza district has been recognized by the business interests of the community to such an extent that they have very recently formed the Queensboro Plaza Association, composed of those directly interested in property on or adjacent to the Plaza. This organization plans to work along lines similar to the Fifth Avenue Association for the protection and guidance in the development of this territory. It is working in co-operation with the Queens Chamber of Commerce, many of the officers and directors being identified with the Chamber. D.E. McAvoy, President; E.A. MacDougall, Vice President; Philip Brewster; Vice President; Frank E Breyfigle, Secretary; P.F.W. Ruther, Treasurer. The Directors are: Philip Brewster, E.A. MacDougall, Jarvis Hicks, Theodore C. Woodbury, T.B. Fogg, C.G.M. Thomas, D.E. McAvoy, H. Pushae Williams, Curtis A. Peters, D.W. Quinn, Ray Palmer, Bernard Stavracos, P.F.W. Ruther, John J. Kindred, and Ten Broeck M. Terhune. Service Started Through Queens and Montague Street Tubes. The new subway link and the tunnels connecting the Brighton Beach line with the Broadway subway and extending that line into Queens opened at 2 o'clock this morning. It will be operated on holiday schedule today. Tomorrow the the regular service will begin. Transit Construction Commissioner John H. Delaney, accompanied by Deputy Commissioner Ryan, Chief Engineer of Transit Construction Daniel L. Turner, General Manager W. S. Menden of the Brooklyn Rapid Transit Company and other officials of the line made a tour of inspection of the new lines yesterday. The Brigton Beach line enters the subway at the Prospect Park Station and after passing through the new Montague Street Station joins the Broadway Subway at the Whitehall Street Station. The line is now open from Sixtieth Street and Lexington Avenue through the Sixtieth Street tunnel to Queensboro Plaza at Jackson Avenue, in Queens. The service gives an eighteen-mile ride from Coney Island into Queens for a 5-cent fare. Hereafter Fourth Avenue trains will not operate to the Chambers Street Station under the Municipal Building, and there will be no Brighton line trains over the Fulton Street elevated from Park Row to Franklin Avenue.